I received an advance review copy of this book. At first glance, the title We Are Not Such Things does not shed a great deal on the subject matter. The subtitle: The Murder of a Young American, a South African Township, and the Search for Truth and Reconciliation does help bring it into focus. Sometimes, however, a title doesn’t reveal its true meaning until after you have read the book. Such was the case with this book. 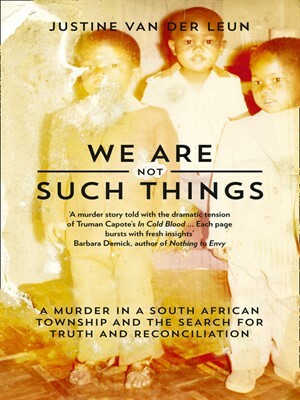 We Are Not Such Things is the story of the murder of American Activist Amy Biehl, who died at the hands of an angry mob of black youths during the waning days of apartheid in 1993. Four young men were identified and sent to prison for her murder. These same four men were eventually released as part of the Truth and Reconciliation Commission, an attempt by newly elected Nelson Mandela of starting with a clean slate. Author Justine van der Leun examines the twenty-year-old case with an investigative journalist’s eyes. Through the course of the book, the reader learns not only about the four accused and their roles, or possible non-involvement but also about the backgrounds of everyone involved with the case, including Amy’s parents. The book is rich in detail. Here is the author’s description of a prison secretary: “But I only got as far as the office of a warden’s secretary, who had arranged a little shrine to nail care on her desk, including a dozen hand creams, a pair of scissors, an orange stick, and several jars of cuticle softeners.” The author provides the same level of detail for just about every character and locale mentioned. While it aids in the telling of the story, it sometimes becomes excessive. One example of this involves a meeting between the author and the chief investigator. The author spends twenty to thirty pages building up to the meeting. When we finally get to the important meeting, the author veers off course for another twenty pages as she talks about the history of the South African police. By the time she returns to the meeting, the impact is lost. Still, this is a book worth your time. The themes of class, poverty, education, and reconciliation all come together to paint a complete picture of a moment in time. The pre-release version I read did not have images or maps, which would have been helpful. They are, however, present in the new release. Lastly, about that title. It refers to a statement made by one of the accused after a prosecutor compared his actions to a pack of sharks smelling blood. I get it now.